This month's cartoon shouldn't leave you in stitches, but it should help you laugh. 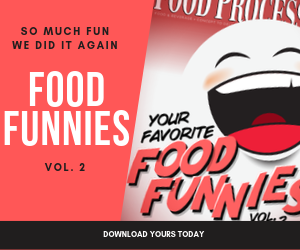 Be a part of the fun by checking out our Food Funny caption contest. Food safety is no laughing matter....except when there's a cartoon and a contest involved. Gobble up the fun with this month's cartoon caption contest. We've got humor in the bag for this month's humorous cartoon caption contest.